The 12-month forecast indicates intense deficits in Turkmenistan, Uzbekistan, western Kyrgyzstan, and Tajikistan. Deficits are expected to be extreme along the Amu Darya River and exceptional in the Fergana Valley. Conditions of moderate deficit are forecast for western Kazakhstan, but may be extreme along the Ural River from the Caspian Sea past Orenburg, Russia. In Russia, moderate to severe deficit conditions are forecast for the vast Ob River Basin, along the Pechora Sea in the north, and from the Yamal Peninsula along the Kara Sea. Surplus is forecast in the Don River Basin, and conditions of both deficit and surplus are forecast in European Russia as transitions occur. Farther east, past the Urals, surplus conditions are forecast between the Ob and the Yenisei Rivers, and may reach exceptional intensity. The forecast through June in Russia indicates that surplus conditions will shrink in European Russia, persist in the Tom River watershed, and transition to deficit in the Ob River watershed. Deficits will also emerge surrounding Orenburg on the Ural River, and between the Lower Tunguska and the Angara Rivers in the Yenisei watershed. In Kazakhstan, surpluses will continue in the north, but will diminish elsewhere. 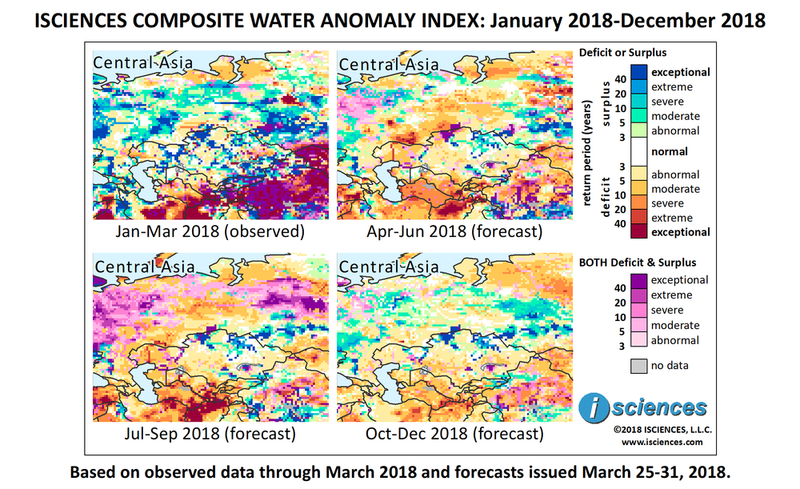 Moderate deficits will emerge in western Kazakhstan, with extreme deficits on the Ural River leading north into Russia. Severe deficits will develop throughout Turkmenistan and eastern Uzbekistan, and deficits of greater intensity in western Kyrgyzstan and Tajikistan. From July through September, intense surpluses will continue to emerge in Russia from Novosibirsk Oblast eastward past the city of Krasnoyarsk. Deficits will diminish around Orenburg along the Ural River but will remain extreme; deficits along the Ural through western Kazakhstan will, likewise, remain extreme. Surpluses will persist in northern Kazakhstan and exceptional surpluses will re-emerge in northern Kostanay Region. Deficits will continue in Turkmenistan and Uzbekistan and are expected to be exceptional along the Amu Darya, and in the easternmost regions of both nations, reaching into Tajikistan. The forecast for the final months – October through December – shows the re-emergence of surplus conditions in European Russia, and in the Vakh, Taz, and Yenisei River watersheds. Deficits are forecast to persist for Turkmenistan and its neighbors. An effort to clear ice-bound shipping lanes on the Irtysh River in Kazakhstan using 600 kg (1,322 lbs) of dynamite resulted in a larger than expected explosion that injured several people and shattered windows in nearby buildings and homes. Flooding in East Kazakhstan continued through March, where 750 people were evacuated in the last five days of the month. The federal government has promised 2 billion tenge (US $6.25 million) to address the situation. Caused by snowmelt and a three-fold increase in normal precipitation, flooding has affected 50 communities throughout the country, forcing 3,800 evacuations and inundating 1,500 homes. The worst flooding in 30 years - the result of melting snow, recent rainfall, and ice-jams along some rivers - has hit Russia’s Altai Krai region in Siberia. Two deaths were reported, thousands of houses affected, and a state-of-emergency was announced by the regional governor. Around 1,500 emergency personnel have been deployed. Forest fires are raging across Russia’s Far East, where 53 fires were recorded in the first few days of April, increasing by 20,000 hectares (80 square miles) per day, according to the local forestry department. Fires are common in the region as snow cover recedes, and recent satellite imagery from NASA depicts those close to the Chinese border near the Amur River. The forestry department indicated aircraft, personnel, and equipment are working to control the blazes. Uzbekistan and Tajikistan have signed a water and energy agreement that resurrects transfers of electricity between the two nations for the first time in almost 10 years. Prior to the secession of cooperation in 2009, the two countries each supplied electricity resources to underserved regions of the other. The new agreement may resolve a conflict over hydroelectricity projects allowing Uzbekistan to be involve in and benefit from Tajikistan’s plans. The friendly developments parallel a general improvement in relations since the2016 election of Shavkat Mirziyoyev as President of Uzbekistan. A new effort by the World Bank aims to help Central Asian countries adapt to current and future climate risks. The Central Asia Hydrometeorology Modernization Project, a $28 million investment, will improve weather forecasting and early warning programs in the region.